Imagine the scene: You’re guarding your fortress, patrolling the outer walkways, when suddenly a massive army comes streaming over the hill. Hundreds of screaming soldiers are headed straight towards you. As panic rises in your throat, you manage to shout the alarm, and your fellow guards scramble to slam the outer gate shut. You know it’s futile. There’s no way that your fortress can withstand such a mighty onslaught. The light that glints off so many sets of armor is almost blinding. You squint, trying to make out details as the angry horde comes ever closer, and suddenly you notice what every soldier is brandishing high over their heads: butter knives. That’s a pretty silly scenario, right? Who on earth would try to storm a fortress armed only with butter knives? Every good warrior knows the importance of a good weapon. You know it, too, which is why you’re looking for the perfect accessory to your warrior costume. Here’s a hint: it isn’t a butter knife. 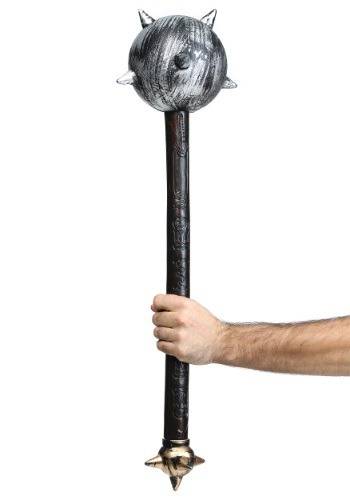 It’s something a little more imposing—like this 27-inch Spiked Mace. The molded plastic weapon is painted to look like wood and metal, with spiked balls on both ends. Now that’s a weapon!